Photograph: Nyholm & Lincoln, c. 1930, as reproduced in Architectural Forum in November 1930. 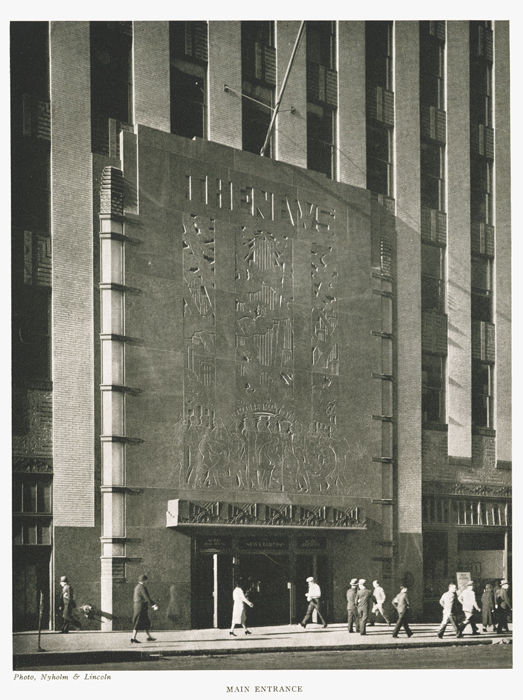 The monumental limestone entrance on 42nd Street that Hood described as a "small explosion or architectural effect" features a polished granite bas relief--a city scene that places the News Building at the apex of the skyline and shows a crowd of New Yorkers grouped under the banner "HE MADE SO MANY OF THEM." The phrase was taken from a quotation of Abraham Lincoln: "God must love the common man. He made so many of them." "There are two parts to the building--the newspaper plant and offices, and the office building for general renting. The income from the general office building portion is what makes it possible for The News to have its plant on an expensive, centrally located piece of property. This is a very valuable consideration for the newspaper, from all points of view-collection of news, manufacturing and quick distribution of papers--but it would not been a sound financial scheme but for the great revenue-producing office building." Hood used his business acumen to convince his client to construct a 39-story office tower. 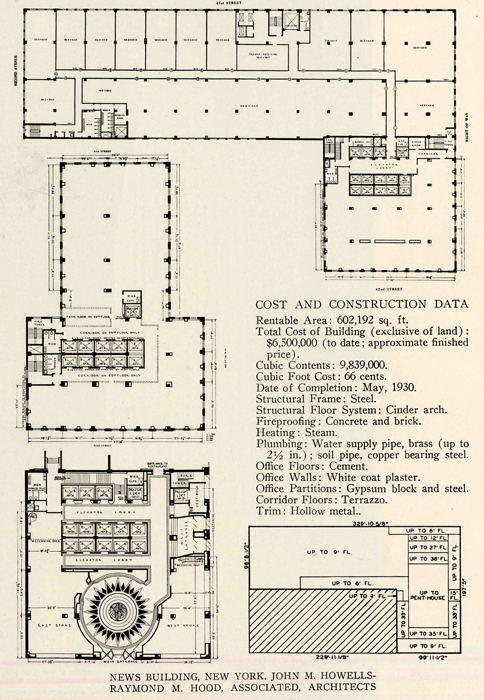 Since the zoning envelope for the site allowed for a much larger building, Hood presented Patterson with a series of drawings and sets of figures that showed how an office building could substantially increase the rental income without increasing construction costs. As with his later designs for the McGraw-Hill Building and the RCA Building at Rockefeller Center, Hood emphasized the tower form rather than the more conventional setback massing.